Free Phone Quotes - 770-GO-ROYAL - Call for Service! Plumbing Newnan- and also Greater Atlanta Georgia. We cover Newnanand ALL surrounding areas, We are your go-to plumber in Newnan, Georgia. A Place Where ALL Your Plumbing Needs Are Met! In this day and age, we understand that you have many choices as to who you’ll use to do your plumbing service. We have designed this web site to show you not only the services we do, but also to tell you more about whom we are as a company and what sets us apart from the competition. For a better idea of what we are all about, please check out our Mission Statement. Please enjoy your time here on our website and remember to always surf safely. We offer full service plumbing to all of our commercial customers. We have made a name for ourselves by offering our services over the whole state of Georgia as well as parts of Tennessee, Alabama, and South Carolina. We offer a 90 minute Emergency Response Time Guarantee to anywhere in Georgia that lies north of Macon. We pride ourselves on always being there when you need us, no matter what time day or night. We perform top notch service at a reasonable rate so if you choose Royal Flush, you’ll never need another plumber. Royal Flush Plumbing….One Call That’s All! No matter what your job is, big or small, we specialize in customer satisfaction. Our technicians are trained to not only fix your plumbing problem, but also to explain everything in depth and in a way that you can understand. We operate on a flat rate pricing system and quote all of our jobs up front so that you know exactly how much you’ll be spending and what you are getting for that money. Also we give some of the best guarantees in the business and pride ourselves on being there to stand behind our work. Call Royal Flush for all your plumbing and drain cleaning needs! Call us now 770.385.5911 to get a free phone qoute and learn how Royal Flush Plumbing can help you with all of your Plumbing needs! 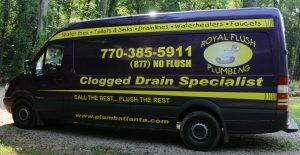 Plumbing Atlanta, Georgia and Surrounding Communities with Over 25 Years Experience! Royal Flush Plumbing is located in Atlanta and is a staple in the community for over 25 years. We are your go to for your full range of residential and commercial plumbing services. We are committed to providing professional, honest, and affordable service on every job!